Hey folks! There is now a better mousetrap for accessing the forums from a mobile device. Here is a video on how to install it and how to use it. 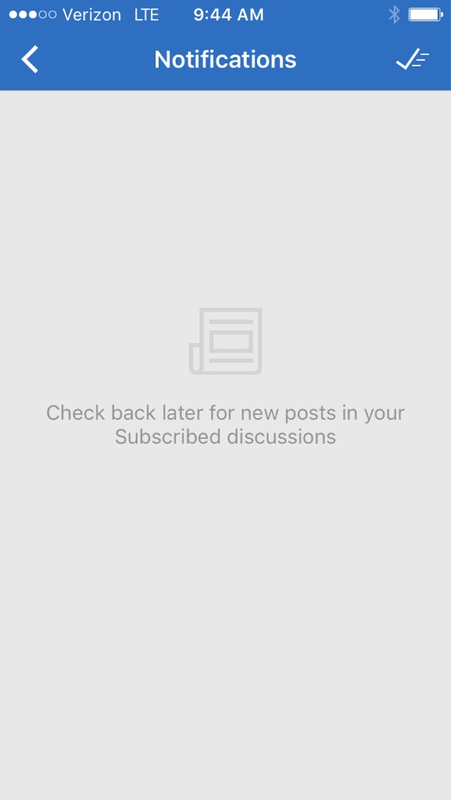 If you are using Tapatalk already, it is really just a branded version of that - so if you have multiple forums connected, you may want to stay with Tapatalk, or not, your choice (you CAN have both!). One of the great things about the new app, is it makes it really easy to post pictures from your phone. I will soon be starting a "travelog" area where folks can start posts about their trips and share for all to see. Last edited by SJ; 02-10-2017 at 05:33 AM. Great... now I'm even more addicted. I'm not figuring how to add a photo while replying to a thread. "...We're fast enough to get there, But slow enough to see..."
Click the plus button to the left of the text box Kem - it will open a larger reply box with all options. Thanks, guys. I've had a couple crashes with the app using the camera / photos. Be sure to click the "report crash" link if that option is offered, its helps get to the bottom of the problem. I've switched from Tapatalk. Looks almost identical to me. I'll support SJ's app. SJ, the signature line is no longer being transferred from the app settings it seems. At least mine is different. 1. The app has its own signature which you can edit under settings (upper right). Aha. If you use the quick reply it posts a generic mobile signature. 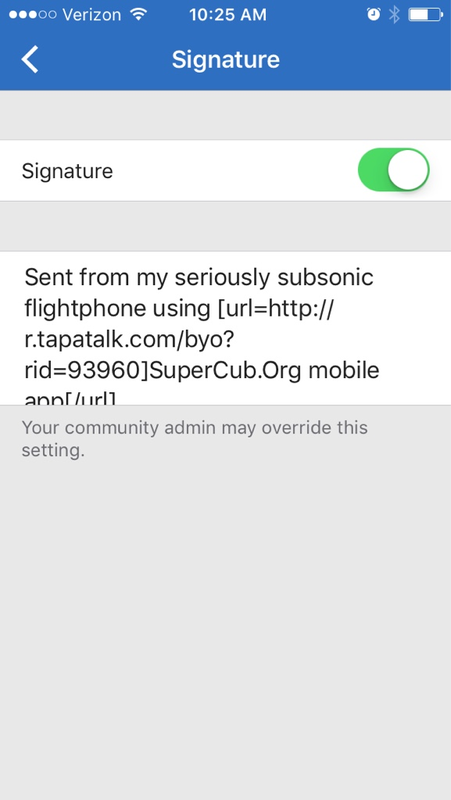 If you open the large response box it posts your preset app signature. Last edited by Farmboy; 02-17-2017 at 01:32 PM. That's cause I changed it. Tim can you confirm you user name and password by logging into a computer? Hey folks if you are supporting member of SuperCub.Org be sure to login to the app with your SuperCub.Org.org username and password as this will give you an ad free experience in the app. Hey SJ, the notifications on the app never seem to indicate properly for me, or I don't know how to read them. Under notifications all have a number showing but when I click on notifications it's blank. Am I supposed to see the notifications under that menu? The odd thing is that the notification number that shows up in the app doesn't match the computer experience, for example it showed eight this morning in the computer showed zero. Pete, just want to confirm this is on an "I" device (iphone/ipad). You are not the first to notice this on those devices. Let me see what I can figure out. Crazy weekend coming up so it might be Monday! I just made an updated to the underlying software, but I think there is more to it. I shall get to the bottom of it! Ok, I pulled up the app this morning and I had 99 notifications. I tapped on notifications and it took me to a screen of all I had not read. In the upper right is a funny looking checkmark I tapped that and cleared all the notifications. Nope, ever since you updated the underlying software I have had no notifications in the app. Did you turn them off in the app? No, but I checked to make sure. I still get the push notifications from the app, just none inside the app if that makes sense, showing a number and a list of unread, etc. How do I stop all the ads? Members who are logged in should not see ads in the app. Ahh. Thank you. Very nice! You have to wait three seconds. I just thanked and unthanked and liked and unliked your post above... Now that is on the computer, I will have to try it on the app as well. I can do it on the computer, as I can via a browser on the phone. Seems to be an app thing for me.. It tells you you "liked" or "thanked" it, and removes the icon allowing you to reverse that decision. Although I have not tried to work around it, research says that it is a limitation of tapatalk and our branded app. But hey! What's not to like? Whats the advantage of using the app vs just using my browser? Kinda seems like a solution in search of a problem? 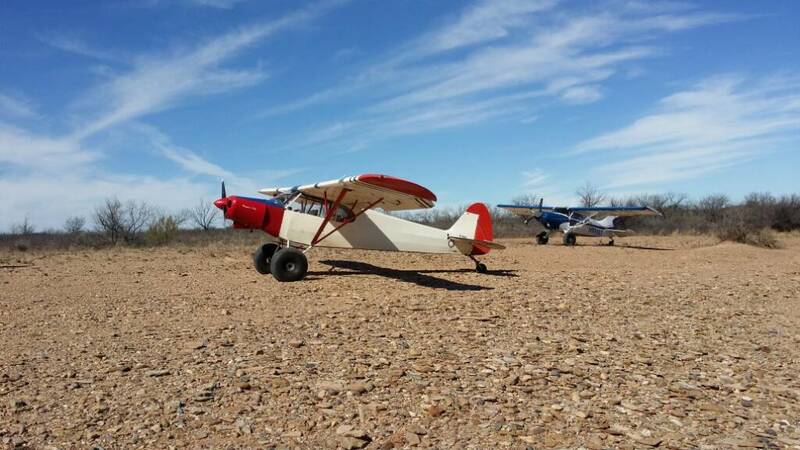 Cessna Skywagon-- accept no substitute! The app is the easiest path to uploading pictures. I can be on my browser and I’ll switch to the app to add pictures. Uploading pics from iPad and iPhone?